If you have had the priviledge of working for someone who is, you know it. Thankfully, I have! I consider myself very fortunate to have worked for some inspiring leaders during my career. Two, Bruce and Don, are true leaders who lead! Dictionary.com defines credibility as "having the quality of being believable or worthy of trust." Synonyms include: trustworthiness, dependability and integrity. There can be no doubt that leaders make an indelible imprint in the lives of those they lead, either positive or negative. 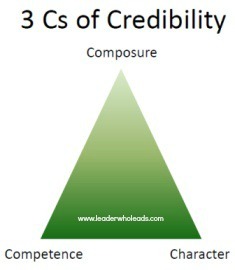 They are "The Three C's of Credibility" developed by Keilty, Goldsmith and Company. I was introduced to this model early in my career and it has proven significant in my development as a leader. These traits are not limited to those who hold a leadership position. They apply to everyone. But the leader who consistently models these traits achieve extraordinary results. Being well versed in your "craft" or area of expertise is a must for every leader. They are competent from a technical/functional standpoint AND they are emotionally intelligent. They understand that they do not know everything, nor do they need to. They have the ability to leverage the expertise of their team to achieve desired outcomes. Credible leaders are life-long learners. They know there is always something new to learn or ways to view situations with new eyes. Composure refers to the ability to maintain self-control, especially when stressed or faced with the unexpected. It is the ability to remain cool under pressured, not easily rattled when things do not turn out as planned. I really like the way David Shields defines character. It is the best description I have heard thus far. He says, "Character is unfakeable goodness." It is authentic goodness, sincerity without manipulation or selfish intent. Character is who you are, your true self; the real you inside; the person you are at your core. It comprises your motives and intent, the condition of your heart. The video below explains in more detail what motivated him to write the book "The Road To Character." David's comments about "resume virtues" and "eulogy virtues" are very impactful. Both are necessary to be successful in the workplace (and in life). Unfortunately, more effort has been spent to develop and promote the former rather than the latter. Credibility is built over a lifetime but can be lost in a moment. Please take time to reflect on these three traits of credible leaders and complete this SWOT Analysis to identify your strengths, weaknesses, opportunities and threats. Then take steps to close the gaps.